Rolling work stoppages across Victorian schools have been threatened, with the first to occur in Premier Ted Baillieu’s electorate of Hawthorn. As part of Wednesday’s teachers strike Australian Education Union (AEU) members voted not to hold another full-day strike this year but instead implement rolling work stoppages expected to be begin in Term 4. However it was confirmed if a resolution was not reached with the government then another full day strike would occur on February 14 next year. As many as 400 schools were closed when an estimated 40,000 teachers, principals and support staff walked off the job in Victoria’s largest-ever teacher strike. 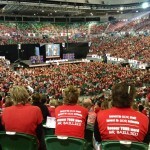 Deuce … Striking teachers pack the Rod Laver Arena to serve up their complaints to the Victorian Government. Around 15,000 rallied at Rod Laver Arena in Melbourne in protest against Premier Baillieu’s “broken promise” to make Victorian schools teachers the highest paid in Australia. The AEU is seeking a 30 percent pay rise for teachers over the next three years as well as a 50 percent cut in short term contracts. The Ballieu Government has offered an immediate 2.5 percent increase becoming 8 percent over three years with an annual performance bonus of up to 10 percent. State opposition leader Daniel Andrews addressed the crowd as it converged in front of Parliament House. He told the crowd that they could rely on the ALP to listen to their requests. “My commitment to you is not a big promise but a genuine promise,” he said. He also urged parents and the public who had been inconvenienced by today’s protests to direct their frustrations at Premier Ballieu. “Don’t be angry at the teachers,” he said. “Don’t be angry at the support staff. 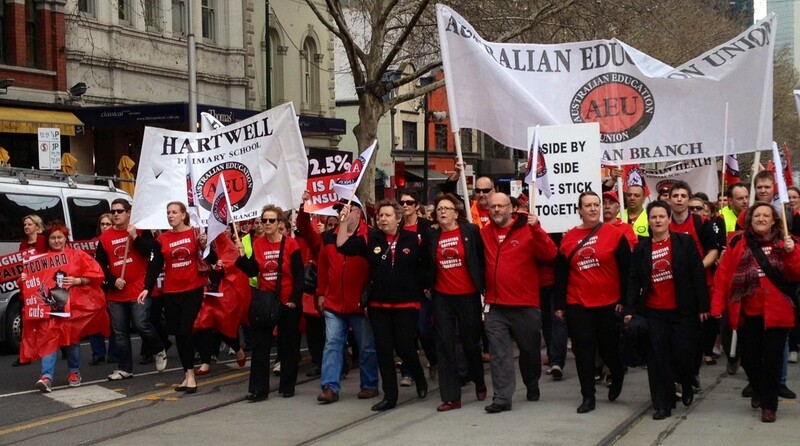 AEU Victorian branch president Mary Bluett said the strike had been successful in drawing attention to the public and to the Premier. “It motivates him (Mr Baillieu) to return to the negotiating table,” she said. Premier Baillieu said the action was unnecessarily disruptive to parents and students. “The only thing that was achieved today was to disrupt students, to disrupt families and to disrupt schools,” he said.